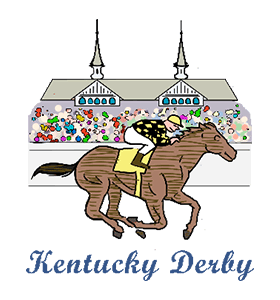 ﻿Kentucky Derby: Calendar, History, Tweets, Facts, Quotes & Activities. The Kentucky Derby is the most popular and oldest horse race in the world. The race is a 1.25-mile long, Grade I stakes horse race for three-year-old thoroughbreds on a dirt track. It is held annually at Churchill Downs racetrack in Louisville, Kentucky. The Kentucky Derby, run on the first Saturday in May of every year, is the first leg of the elusive Triple Crown races. It is followed by the Preakness Stakes two weeks later in Baltimore, Maryland and the Belmont Stakes, 3 weeks after the Preakness in Elmont, New York. Meriweather Clark founded the Kentucky Derby, which was first held in 1875. Since then, the Derby has become a day of luxury and fashion and celebrities are often in attendance. Over 160,000 spectators come to see the Kentucky Derby every year while millions of others watch it on TV. In Kentucky, the equine industry generated 3 billion dollars annually and creates 55,000 jobs. As of 2015, no woman trainer or jockey has won the Kentucky Derby. Many have run horses and ridden them, but none have won. Only 12 horses have ever been able to win the Triple Crown. The most recent was American Pharaoh in 2015. Prior to 2015, the Triple Crown hadn't been won since 1978. Tune in to watch the Derby live on the first weekend of May. It is usually broadcast on many sports networks around the world. Attend the Kentucky Derby in Louisville, Kentucky. Be careful though, tickets are very expensive and must be purchased far in advance for the event. Enjoy a good movie about horses and horse racing. Some of our picks are: The Cup (2011), The First Saturday in May (2007), Racing Stripes (2005), Seabiscuit (2003), The Derby Stallion (2005), Secretariat (2010) and Dreamer (2005). Book a horse back riding class at a local stable. Try to get a feel for what it would be like to race that fast. Plan a Triple Crown Party. Be sure to send out invitations for the Derby, the Preakness and the Belmont. Pick favorite horses and see who wins the home derby.